As any city dweller can attest, every smell grows big in summer. The heavy molecules released by fossil fuels from cars, trucks and buses magnify the grit and funk of the metropolis. In choosing a perfume, we gravitate towards those that will give us respite from unpleasant urban odors; we crave a feeling of just-showered freshness that can last all day. The following selection of summer scents runs the gamut from natural to synthetic, from classic to avant-garde. Mûre et Musc and Fils de Dieu celebrate nature’s bounty, containing notes evoking fruits, herbs, woods, and earth. With L’Eau, Serge Lutens takes on the ultimate perfumer’s challenge: to translate into scent that which has no smell. A single, odorless molecule called Iso E Super is the only ingredient in Molecule 01, a perfume that adds dimension to the smell of your own skin without having a scent of its own. From earthy to sheer, these perfumes will have you smelling wonderful throughout the dog days of summer. Son of God, of rice and citrus. The name of this perfume is richly suggestive. It speaks to the sacred, and pays homage to two pillars of Asian culinary culture. Fils de Dieu, however, isn’t your typical gourmande. Ralf Schweiger is the nose behind this fragrance, and he is also the master perfumer behind Hermès’ Eau des Merveilles and Editions de Parfums Frédéric Malle’s Lipstick Rose. In Schweiger’s magical hands, jasmine rice cooked in coconut milk, tiny green limes and shiso leaves become ethereal and radiant. Fils de Dieu is a conceptual version of these classic flavors ren-dered light enough to wear on the skin. Notes of sandalwood and leather, both barely there, add volume to the overall bouquet, stirring images of a Buddhist temple in Thailand. Schweiger excels at making shim- mering scents that are perfectly balan-ced between light and dark, perhaps owing to a childhood spent in Westphalia, Germany. It’s a part of the country known for its reverence of nature and its vast, green forests, as well as the critical role it played in the exhibition of contemporary art in the postwar era. A consummate alchemist, Schweiger melds art with a respect for nature to produce glamorous and enduring fragrances. Molecule 01 is a perfume that doesn’t smell very much like anything from the bottle or the blotter, and its aroma is barely detectable on one’s own skin. There is a suggestion of amber and wood floating in turpentine, but it fades in and out like a soft breeze. The only means of knowing how you smell in Molecule 01 is to douse oneself in it and enter a crowded room. Everyone will gravitate towards you like a magnet, eager to know what you are wearing and to get a closer sniff. Molecule 01’s reputation as a simulated pheromone is not just great ad copy — it’s real. Its power is owed to an aroma chemical known as Iso E Super, a molecule that is too large to be de-tected by the nose directly from the bottle. It enhances other smells that might be in its vicinity and enlarges it, making it the perfect basenote for any perfume. Applied on the skin, Molecule 01 falls off our olfactory radar quickly but lingers in the air for others, giving it a “your skin, but better” smell. The perfume’s creator, Geza Schoen, is famous for his experiments in scent like his collaboration with the publisher, Gerhard Steidl, called “Paper Passion,” a perfume that smells like a freshly printed book. 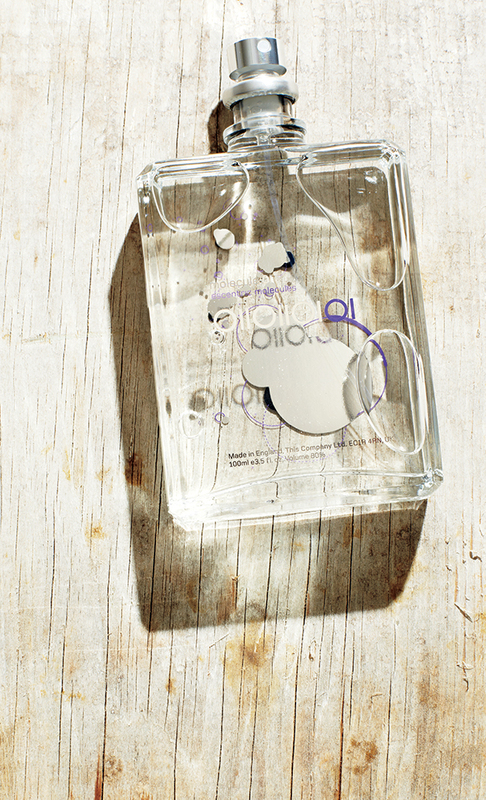 With Molecule 01, Schoen produced the ultimate anti-perfume perfume. 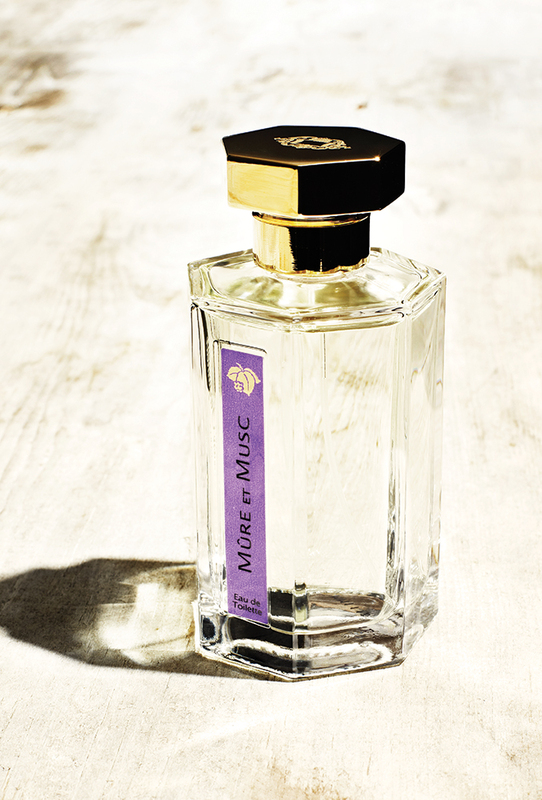 Mûre et Musc was the first perfume to come out of L’Artisan Parfumeur, a line created by Jean LaPorte in 1976. The unusual and intoxicating com-bination of sweet berries wrapped in the warm embrace of musk made it an instant classic, and established L’Artisan as the first niche perfume company. Jean Laporte sought to wrest perfumery from the grips of fashion designers like Chanel, Dior, and Yves Saint Laurent, and give it back to independent companies who could focus on being as creative as possible by utilizing the highest quality ingredients. Mûre et Musc opens with a bright burst of Mandarin orange mixed with Amalfi lemon, a lemon so sweet that it’s said one can peel and eat sections of it without being overwhelmed by sourness. This syrupy citrus quickly gives way to overripe berries decaying in bright sunshine on an August afternoon, the aroma mingling with the woody stems and green leaves of a luxuriant blackberry bush. Musk envelopes the fruit notes but lightly, like a veil, as does tendrils of earthy oak moss. It’s playful and sensual — a perfect accompaniment to summer. In 1920, Marcel Duchamp went to New York and gave his friend Walter Arensberg an empty glass ampoule called “Air de Paris.” Inside was the air of Paris, trapped and brought across the ocean like a delicate travel sou-venir. No doubt “Air de Paris” was on Serge Luten’s radar when he created L’Eau. As an internationally exhibited photographer, filmmaker, and former creative director of Shiseido, Lutens is continually engaged with the history of art, and with L’Eau, he created his first conceptual olfactory work. L’Eau was released in 2010 as the first of Lutens’s “Diffusion” series. He writes: “In my mind's eye, I kept seeing a hot iron moving back and forth on freshly washed linen. I finally distilled the image into a fragrance to get it out of my head.” We are all familiar with the scent of freshly ironed cloth: as high heat is applied, moisture evaporates, disseminating into the air the scent of laundry detergent and softeners embedded in the fibers. Sprayed on the skin, L’Eau starts with an astringent lemon and mint tea combination before morphing into an artificial soapiness that lingers for a long time. L’Eau keeps one smelling freshly showered even in sweltering humidity.